A promotional device for The Economist. 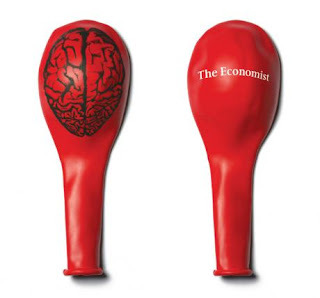 The brain balloon suggests that if you read The Economist your will gain intelligence. As the balloon is blown up the image of the brain grows. Simple and effective advertising. This reminds me of a campaign for the congestion charge (C) in London where a red balloon is over a petrol exhaust. It could be seen as the more petrol you use...for example the more you drive the more it will cost you...in money and CO2 emmisions. The balloon is an advert in itself.